For a church visit like no other, head to Ribadeo, on Spain’s northwest Galician coast, where wave-carved, hundred-foot rock arches resembling flying buttresses of Gothic cathedrals line the sand. Walk among them at low tide, but beware, when the Bay of Biscay rises, the beach quickly succumbs to the surf. 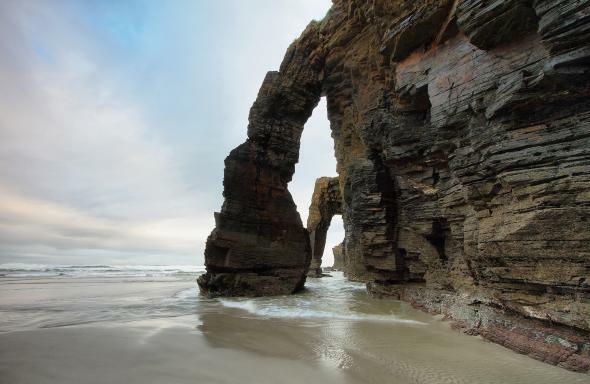 As Catedrais beach translates as ‘Beach of the Cathedrals’. It is the turistic name of Praia de Augas Santas. The Spanish beach is located in the Ribadeo municipality, in the province of Lugo, on the Cantabric coast, and it lies about ten kilometres to the west from the town of Ribadeo. Its name is derived from the formations of its cliffs. The place’s more characteristic features are its natural arches and caves, which can be seen only in low tide. During high tide, the beach appears quite small, but is still suitable to go for a swim. High tide is an interesting time to visit the place and wander over the top of the cliffs, from West to East, heading to the Esteiro Beach. During low tide you can appreciate the size of its magnificent cliffs and the picturesque sea caves, which go from small cracks on the rock to big caves whose roofs collapse due to the erosion of the waves. Also during low tide you can gain access to a sand deposit delimited by a rocky wall made from slate and schist of strange and complex forms: more than 30-meters-tall arches which remind to cathedral flying buttresses, dozen-meters-long caves, sand corridors between rocky blocks and many other curiosities. When low tide is lower than usual, you can access the nearby beaches through the sand extension. However, it is advisable to be back before the water starts to cover the beach again, which happens very quickly, since the coast stretch is almost horizontal.